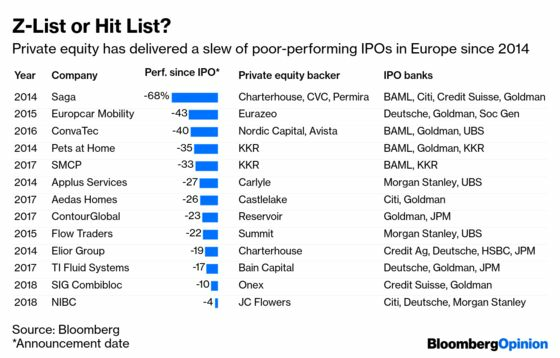 (Bloomberg Opinion) -- Private equity-backed initial public offerings are getting a bad name again. The small consolation for investors who have lost money on them is that leveraged buyout firms appear strangely keen to buy many of them back. Saga Plc, the British insurer for the over-50s, is the latest former private equity property to inflict pain on its new owners. A profit warning last week brought the stock’s decline since its 2014 listing to 68 percent. It’s far from alone. Medical devices group ConvaTec Group Plc, a serial issuer of profit alerts, is down 40 percent since going public three years ago. The poor business performance of these and other companies taken public by financial sponsors explains investors’ aversion. Yet it’s a different story for the buyout industry. Their fallen listings make good targets for a second bite of the cherry – sometimes by the same firms that sold them. The advantages are clear: the assets are a known quantity – either directly, or through past ownership of rivals in the same industry. When stock market valuations are mostly high, it’s better to overpay for what you know. Call it the familiarity premium. Meanwhile, there seems to be less competition from corporate CEOs. They could be nervous about what’s coming next from the economy, or that any attempt at M&A will be attacked by an activist. Add in that private equity has more money than it knows what to do with and has continued access to dirt-cheap debt financing, and the merry go round starts making sense. The misplaced temptation is to view any struggling private equity IPO as a certain takeover target. In reality, circumstances matter. Some of these companies were doubtless overpriced, some came to market too soon, others may have lost their way after their hard-nosed private equity owners moved on. It’s not clear that any one particular bookrunner is the problem. There is another factor at play. Anecdotally at least, private equity firms appear to be getting more active in targeting public companies regardless of their history due to their frustration with the high price expectations of private sellers. If the trend continues, it is hard to avoid the conclusion that the chain has some weak links. Either the IPO process is flawed in failing to price these offerings properly, or the governance of public companies is worse in the public markets than under private equity, or institutional shareholders aren’t doing enough to stiffen the spine of boards when private equity comes dangling a lucrative pay packet. Or it’s a mixture of all three.